A former Russian spy and his daughter were exposed to a nerve agent and remain critically ill after they were discovered unconscious Sunday in Salisbury, England, police said today. Yulia Skripal, 33, had been visiting her father, Sergei Skripal, 66, before the two fell suddenly ill. The incident is being treated as attempted murder, Mark Rowley, the Metropolitan Police Service’s assistant commissioner, said, adding that the pair were targeted specifically. Hundreds of detectives are working on examining footage from the area where the two were discovered, Rowley said. Sergei Skripal, who was found critically ill in Salisbury, England, is seen in this 2006 photo from his appearance in a Moscow District Court. Sergei Skripal, a former Russian agent, was convicted of spying for Britain in 2006 and had been sentenced to 13 years in prison, but was part of a prisoner exchange with the U.S. in 2010. He had sought refuge in the U.K. and been living a quiet life under his own name in Salisbury, Wiltshire. Toxicology experts and the military research center of Porton Down are involved in the investigation. The center is located just outside of Salisbury. “We are carrying out extensive inquiries to establish exactly the circumstances behind this incident and would like to hear from anyone who has information about the incident. In particular we are keen to hear from anybody who visited the area close to the Maltings shopping centre where these two people were taken ill on Sunday afternoon, and may have seen something that could assist the investigation,” police said in a statement. CCTV footage from a gym appeared to show the two heading for a small park in the center of Salisbury, yards away from the camera’s location. The Mill pub in Salisbury is closed, March 7, 2018, after former Russian double agent Sergei Skripal was found critically ill by exposure to an unknown substance in Wiltshire, England. Police were called after concerned members of the public reported the two were unconscious on a park bench near The Maltings shopping centre in Salisbury. Two witnesses say Sergei Skripal exhibited strange movements and appeared incoherent. A nearby Italian restaurant was sealed by police on Monday night and remained closed on Tuesday. A local pub The Bishop’s Mill was also shut down in connection with the incident. A policeman stands outside the Zizzi restaurant in Salisbury, England, March 7, 2018, near the area where former Russian double agent Sergei Skripal was found critically ill. The investigation is being led by the U.K.’s Counter Terrorism Network. In a statement on Tuesday, Wiltshire Police stressed that the network was taking the lead not because there was a confirmed counterterrorism aspect to the investigation but due to the unusual nature of the incident. Police also revealed that several emergency services staffers were treated after responding to the incident, and that one police officer was still receiving medical treatment and is in serious condition. Parliament member Amber Rudd appeared on “Good Morning Britain” on Thursday and said she’d recently spoken to Rowley about the sickened officer. 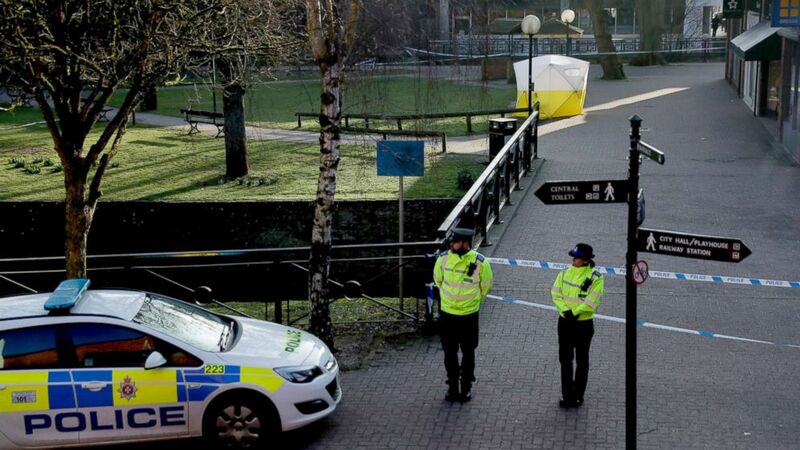 Police officers guard a cordon around a police tent covering the the spot where former Russian double agent Sergei Skripal and his daughter were found critically ill following exposure to an “unknown substance” in Salisbury, England, March 7, 2018. Comparisons have been made with the 2006 poisoning of former Russian spy Alexander Litvinenko, who was murdered after drinking tea laced with polonium. An official British inquiry found the Russian state was behind the killing, and suggested that Russian President Vladimir Putin may have given the orders for the attack. The Kremlin has denied any involvement in the murder. Moscow has promised to cooperate with the investigation if the British ask for assistance, although the Kremlin on Tuesday denied having any information on the case.